I'll be closing the Yuricon & ALC LiveJournal account this week. Or please feel free to join us on the Yuricon Mailing List - still going strong since 2001! Our written archive of personal histories relating to Yuri is now online, with the first two sets of essays! Enjoy the Q&A with Morishima Akiko-sensei from the 2005 Yuricon in Tokyo program book, in English and Japanese, and an essay from Katherine Hanson. A vote was held for the first new Yuricon contest and, Art Contest it is. Yuricon Mascots Yuriko and Midori have asked for the first Yuricon Contest theme to be – Every Day is a Celebration! Yuriko, Midori and the rest of the judges look forward to seeing your art! A new essay on the roots of the Girl Prince character so common in Yuri manga. Visit our Essays Page on Yuricon.com or visit this essay directly at Erica's monthly column for Hooded Utilitarian, Overthinking Things. Yuricon custom toolbar has been updated. We've got a brand new website for Yuricon and to inaugurate it, we're running a brand new Yuricon contest! The new Yuricon design is all about interaction - we welcome your comments on our posts and have made it easy for you to share pages of interest and, just as we want you to be part of the website, we are inviting you to be part of the decision for what kind of Contest will be our first! We're running two polls, on our Facebook Community and Yuricon Mailing List, for you to decide which kind of contest it will be: Art Contest, Fanfic Contest or AMV Contest. Since the New Yuricon is all about interaction, we don’t want to know what you want to see as a contest – we want to know what contest you want to participate in! Tell us whether you want to draw a picture of Yuriko and her friends, write a story about them or make a Yuri AMV. The contest that gets the most votes will win. We’ll leave the polls open for a couple of weeks, so roll your sleeves up and get ready to create! In the meantime, visit the Yuriko Art Gallery, the Shoujoai ni Bouken Fanfic Gallery or Yuri Studios for inspiration! Sean Gaffney and I will be doing a Yuri Panel on Saturday, Oct. 30 at 7PM. If you are interested in being part of "The Industry" and want to know what it takes to be an illustrator, graphic novelist, how to make it in Japan or the US, DO come to MangaNEXT! It's got great guests, and lots of "how to" stuff going on. Lea Hernandez will be teaching a Manga Boot Camp and dishing about her experience with Gainax. Graphic Novelist Dirk I. Tiede, creator of OEL Manga Bizhenghast, M. Alice LeGrow, Japanese independent manga artist Kondoh Akino and illustrator Juri H. will all have things to tell you about life "in the industry." I hope to see you there, of course. Yuricon will not have table, because I am on MangaNEXT staff so, if you see me hanging around and talking to someone, that's me working. ^_^ Come join us for what promises to be a really great con! I have been thinking deeply and obsessively on the issue of "fixing" the issues of scanlations. Recently, Jake Forbes proposed something that is almost identical to what I was thinking...and MangaHelpers today announced that they were moving to a format almost exactly what I was thinking of as well. I had written an article about two weeks ago on the issue and my proposal, and was holding on to it in order to be a part of a roundtable on the subject at Hooded Utilitarian. With the news by MangaHelpers today, I couldn't wait and had to post my article on Okazu. I hope you will read it, and promote it, because Yuricon supports this vision of a solution to the solution. 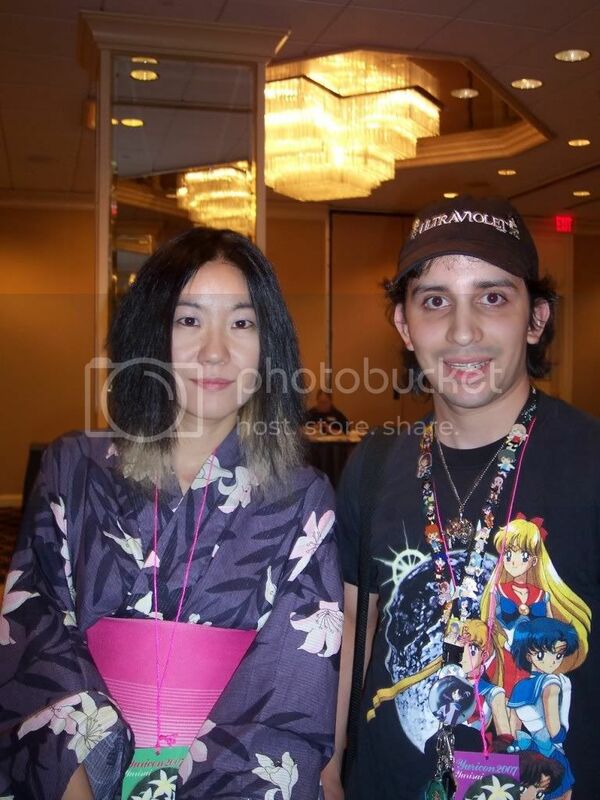 One of my finest memories of Yuricon 2007 was meeting Rica Takashima. Writer and illustrator of Rica 'tte Kanji! ^_^ She was so sweet and even said she admired Naoko Takeuchi. If you would to donate anything Mai HiME or Mai Otome related to Shiznat.webs.com, I'd greatly appreciate it! Also, if you would like to join the community forum, go for it! I started the community, but it's a team effort to support Sunrise's #1 franchise (imo). Continuing with our series of interviews with popular Yuri Artists, Okazu presents an Interview with Fujieda Miyabi, creator of "Iono-sama Fanatics" and "Ame-iro Kouchakan Kandan." Thank you all for your support of Yuri and Yuricon! Everyone, please congratulate the winner of the 2009 Yuricon AMV Contest - Sasameki Koto Falling In Love! Thanks everyone for your support and readership and for being an awesome Yuri Network! I'm looking forward to reading your nominations for Top Yuri manga! Discounts from 30% to 50% on all books, from our award-nominated Yuri Monogatari series, to WORKS by Tadeno Eriko. This sale is for a limited time only, so get your holiday orders in today! So does yuricon exist anymore?